After completing a degree in law, Vanessa grabbed a backpack and travelled the world, ending up in England. Food scares in the UK (mad cow disease, anyone?) got her thinking and researching ingredients and sources of products she was using. Moving back to Australia with her husband and first child, Vanessa couldn’t understand why it was so difficult to buy organic, natural and non toxic baby gear, and thus Hello Charlie was born. Eight years on, Hello Charlie isn’t just one of Australia’s favourite eco baby stores, it’s also a great place for parents to research and learn about buying better for baby. Writing on the Hello Charlie blog, Vanessa covers a broad range of topics from choosing safer plastics, chemical ingredients in baby products, and the ever popular baby product reviews – getting past the greenwash to choose safer products for your children. Vanessa lives in the leafy, green outer suburbs of Melbourne with her husband, two boys, dog, two cats and a spiny leaf insect. When she’s not dreaming up new projects or running around after her two boys, Vanessa can usually be found in the kitchen, or lost in a crime novel. 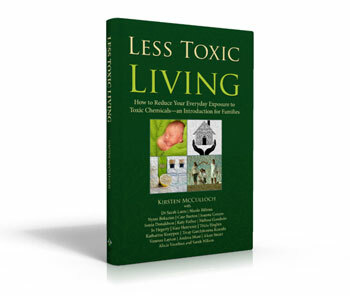 For those who bought the paperback of Less Toxic Living early on, Vanessa generously included a bonus discount voucher in our free bonus section. You can find Vanessa at www.hellocharlie.com.au, or connect with her on Facebook, Google+ or Pinterest.